​Your search for an affordable, high quality backpack ends with High Sierra. No – they’re not a Tier 1 hiking backpack brand like Osprey, Gregory, or Kelty, but they do make long-lasting and durable products with a significantly lower price tag. Now, you’ve probably seen that the High Sierra Titan 55 and Explorer 55 have a whole bunch of excellent reviews on Amazon. And given that they’re the same 55L capacity – how do you know which one to go for? Well, for us at least, you should quit procrastinating and pull the trigger on the Titan 55. For only a fistful of extra dollars you’re getting some pretty handy extra features, such as the ​additional side access and the foam padded back panel. There’s a few other features that makes the Titan 55 a better option for most backpackers and travellers which we’ll dive into below. You might want to also check out a third option – the Appalachian 75 – which is compared below, too, as the extra volume is going to come as a big bonus for some of you heading out on longer treks. ​​The High Sierra Titan 55 measures 29.5 x 14 x 8.25 inches while the Explorer 55 is a little longer and slimmer at 30 x 14 x 8 inches. The High Sierra Explorer 55 weighs 4.3 pounds, lighter than the Titan 55 which weighs in at 4.6 pounds. The High Sierra Titan 55 has a high-density foam padded back panel while the Explorer 55 has a molded foam back panel. The Titan 55 provides access to the main compartment from two spots whereas the Explorer 55 only has one access point. The Explorer 55 is best suited for wear by women and men with small or medium frames, while the Titan 55 accommodates larger frames comfortably. One of the differences between the Titan 55 and Explorer 55 is their overall size. Truth be told, the size difference is not substantial but could still make a difference in the carry-feel. The Explorer 55 is just half an inch longer than the Titan 55. The Explorer’s width is half an inch less than the Titan’s, making it slightly slimmer. This difference may be more noticeable in aesthetic than functionality. There is a small weight difference between these two packs. The Titan 55 weighs 4.6 pounds, making it heavier than the Explorer 55 at 4.3 pounds. This difference will show when the packs are fully loaded. Since they share the same loading capacity at 55 liters, the final difference comes down to the 0.3 pound gap in pack weight. At the end of the day, the weight difference is very small. It is not significant enough to be considered a major factor in terms of comfort. The Titan 55 has a back panel made of high-density padded foam, while the back panel on the Explorer 55 is made of molded foam. The amount of support varies between packs. The high-density padded foam panel on the Titan will provide you with a stiffer feel. On the other hand, the Explorer’s molded foam panel will fit the shape of your back for a more natural feeling of support. If you have any back issues, the Titan’s stiffer support may be helpful. Both the Titan 55 and Explorer 55 can be loaded from the top of the main compartment. You have more flexibility with the Titan 55 which also gives you access to the main compartment from an opening near the bottom of the pack. The Titan 55 provides more accessibility if you find that you need to get into the main compartment during your trip. Despite the small difference in size between the two packs, the Explorer 55 is better suited for smaller to medium-sized frames. The Explorer is ideal for use by children, women, and men with smaller frames. While it can be adjusted to fit larger frames, its comfort decreases. The Titan 55 is constructed in a way that makes it a practical and comfortable option for people with very large frames. Both the High Sierra Titan 55 and Explorer 55 have a top-load main compartment with a capacity of 55 liters. This gives you a lot of room for functional packing. The Titan 55 and Explorer 55 both come with an internal reservoir sleeve. This means you can carry and access your hydration pack comfortably. Both backpacks come with a tuck-away rain cover. This is useful to have on hand if the weather changes while you’re hiking or for protecting the backpack while traveling. Both packs are designed with airflow channels. This is important for maintaining breathability and keeping your back dry. The High Sierra Titan 55 and Explorer 55 are both constructed with a contoured internal frame structure. This structure provides support and increases comfort while backpacking. ​​​Titan 55 and Explorer 55 - How Do They Compare? 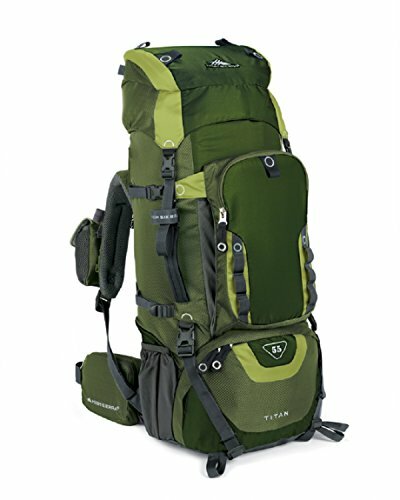 ​High Sierra’s Appalachian 75 is a step up in size and price compared to the Titan and Explorer packs. Named after epic thru-hike, the Appalachian Trail, this expedition-size backpack is designed with lengthy trips in mind via the extra 25L loading volume. Like High Sierra’s other product lines, the Appalachian 75 is not as lightweight as the premier backpack brands – but those bags are going to set you back at least $200. Good quality, chunky zippers that work well even under pressure from a full-load. The extra weight. But, as mentioned above, this is going to be a small trade-off for most you fit folk who want to save a few dollars but still get a very functional backpack. So, to summarise, the major difference between the packs is that the Appalachian 75 has a larger loading capacity than the Titan 55 and Explorer 55. This means that the Appalachian may be better suited to longer trips or trips that require more equipment. The Titan 55 and Explorer 55 are lighter weight packs which means they will be easier to carry over long distances. 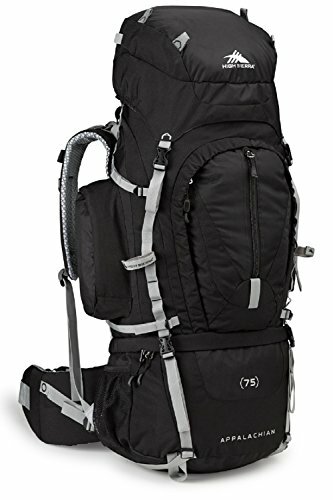 Essentially, the Appalachian 75 is designed to be used for longer, more involved trips by experienced backpackers comfortable with carrying heavy packs. The Titan 55 and Explorer 55, on the other hand, allow backpackers of all experience levels to carry comfortably without sacrificing functional packing. To recap, we really do think the Titan 55 is the stronger option. Since they both have the same capacity and price range, it makes sense to opt for the Titan for the extra features. These include the added side access, foam-padded back panel, and a higher range in terms of torso fit. But overall, the Titan 55 and Explorer 55 are both solid packs for hikers and backpackers on a budget. Your preference for functionality and support will help you decide which pack is right for you. Whereas, the Explorer 55 is a great choice if you have a smaller frame and are looking for a pack to get you from point A to B with natural support. If you’re not the type to open your pack while on the move, this pack is practical. However, it can be frustrating when you need to quickly grab things like sunscreen or a pair of sunglasses, as all of these items must be crammed into the top which can create some annoying need for rummaging around. ​Want more options? Check out our best hiking backpacks buying guide. You might also like our compsrisons between the Ariel/Aura; the Atmos/Aether​; the Kelty Redwing 44 and 50​; and the Volt 60 & 75; which are all similar size backpacks.